Pencils Down, Pass the Remote: Is Rachel Dratch unemployable because of her talent, or her looks? Is Rachel Dratch unemployable because of her talent, or her looks? 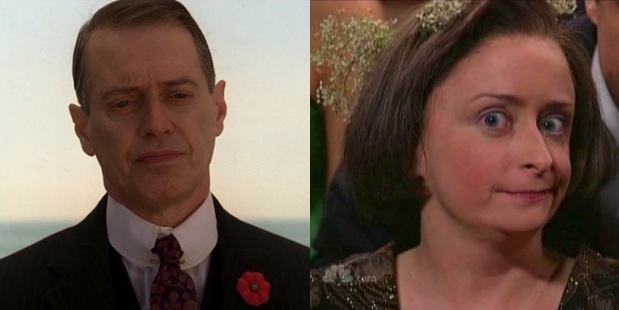 Steve Buscemi on Boardwalk Empire, and Rachel Dratch on Saturday Night Live. Yesterday, Slate's DoubleX blog ran a post by Torie Bosch that challenged recent claims put forth by Rachel Dratch in Girl Walks Into A Bar..., her recently published memoir. In the book, Dratch claims that the rejection that has faced her since she left Saturday Night Live - she was famously replaced by Jane Krakowski on 30 Rock, and her big leading-lady moment Spring Breakdown was relegated to the direct-to-DVD wasteland. But was Dratch really a victim of Hollywood’s insane beauty standards? What if her particular brand of acting—and she has admitted that she is more a character actor—just isn’t right for leading-lady-dom? Am I betraying feminism if I say that I’m just not a huge Rachel Dratch fan? She seems like a lovely person. Girl Walks Into a Bar’s discussion of her unexpected, late-in-life pregnancy is funny and honest and poignant. I’d love to get drinks with her. But as much as I strive to support smart, funny women on TV and in the movies, Dratch’s work doesn’t appeal to me. I actually sort of agree with Bosch on this one, at least to the extent that Dratch's acting style has always turned me off when it appears outside of sketch comedy. In particular, Bosch's claim that Dratch's appearances as various characters on 30 Rock didn't really fit with the tone of the series was, I thought, pretty spot-on. But that doesn't mean that Bosch's argument is airtight. The biggest problem on display is her assertion that Dratch "isn't right for leading-lady-dom" because she is a character actor. The writer appears to have forgotten that "character actor" is generally synonymous with "person who is too unattractive for a lead role." Bosch reverses the causality, assuming that it's Dratch's particular acting style that keeps her from getting lead roles, and conveniently forgetting that Dratch's appearance has, in all likelihood, consigned her to these sorts of roles. Just for the record, I'm not saying that Dratch is by any means unattractive. But she isn't exactly the Hollywood ideal of tall and thin with a small nose, luscious lips and big, but not buggy (! ), eyes. (If you want a somewhat depressing confirmation of this beauty ideal, watch the widely seen "Women in Film" video, embedded below for your viewing pleasure.) If you're too short, like Dratch, or too tall, like Jane Lynch, or too black, like Yvette Nicole Brown, or just somehow not quite right, like Judy Greer (and once again, none of these women are unattractive by any standards except those of Hollywood), you don't get offered the leading-lady roles that provide a showcase for the type of acting ability that Bosch is talking about. The lesson here is that actors who don't fit the Hollywood beauty ideal are often forced into supporting roles, as "the wacky friend" or "the creepy guy" or "the sassy black woman." Look at Steve Buscemi's career if you don't believe me. He may be playing a lead role now, on Boardwalk Empire, but his career up until that point was a string of creepy guys (Reservoir Dogs, Con Air), pathetic schmucks (The Big Lebowski, Paris Je T'aime) and guys who die in incredibly grisly ways (Fargo, obviously). Even his lead role as Nucky Thompson, enjoyable and well-acted as it is, hasn't completely drawn Buscemi out of the character actor ghetto. Reviews of Boardwalk refer to Nucky as "oily, funny, nihilistic, knobby-kneed"; a "gentleman corpose" who "projects only antiheroic vagrancy and irritability"; and "corrupt to the bone and weaselly in intent and appearance." And those were reviewers who liked Buscemi's performance! I guess that's what you get when your appearance makes everyone think that you're a child molester. Bosch is free to dislike Rachel Dratch's acting style. I personally am not a huge fan of Dratch's non-sketch work. But it's a mistake to blame Dratch's lack of leading-lady roles on some sort of mysterious "character actor-ness" without taking a moment to think about why the comedienne has been pigeonholed into those types of performances in the first place.